I had read about the organic stoneground flours from La Meunerie Milanaise (La Milanaise Mills) in Daniel Leader's Local Breads and through numerous posts on TFL. I was anxious to try them so a few months ago as I was in Montreal visiting friends, I was able to bring back three 20 kg bags of their flours. I had to contact the US Customs to have their blessing before driving back across the border with 132 pounds of white powder. I purchased their All Purpose T55, Sifted Flour #100(T70) and Sifted Flour #50(T90) Flours. All are Organic and the latter two are High Extraction and Stoneground. The # designation indicates the fineness of the sieve. 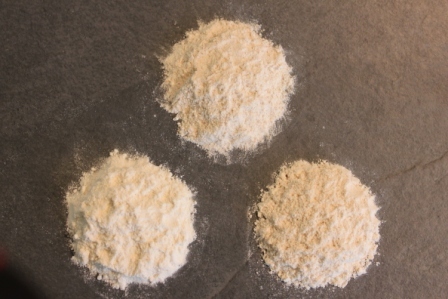 The T designation indicate the percentage of ash content of the flour and is based on the european model of 11.7% humidity content as opposed to 14% for the US. There was a discrepancy in the ash content listed on the bags and the specification sheets that I got from the distributor so I contacted the Milanaise office and got a detailed explanation from Mr. Robert Beauchemin, the Company's CEO. He explains that there is always a variation in the mineral content of wheat from year to year depending on environment and growing conditions. The key is the degree of "cleanliness" of the sifting to allow a percentage of the epiderm layer and the aleurone layer of the wheat kernel into the flour. The epiderm is the darker and tougher outer layer whose ground particles act as knife blades damaging the structure of the gluten while the aleurone is the lighter inner layer which does not damage the gluten. Based on this variation in mineral content, the two high extraction flours that I got are essentially T70/T80 (73.6% extraction and 12.7% protein) and T90/T110 (81.8% extraction and 12.4% protein). It is interesting to note that these are high extraction but not high gluten flours as the protein level is about the same as white bread flour. The All Purpose T55 has 11.4% protein. I have been baking some of my favorite breads using different mixes of these flours and have been extremely pleased with the results. The T55 flour is slightly darker color (light cream color) and grittier to the touch than the King Arthur AP Flour. The T70/T80 has specs of light color bran mixed in and the T90/110 is the darkest with bigger and darker specs of bran. There is no Malted Barley Flour added. All three flours are not as absorbent as the KA flours and I always get a wetter dough using the same hydration. The dough consistently feels less sticky and is more extensible than KA. The dough also feels smoother. The breads are very aromatic during and after baking especially with the high extraction flours giving the crust a dark molasses, caramel, chocolate and roasted nuts fragrance . The crumb is always light, open and soft and the taste has a sweet, creamy and toasty wheatiness. I bought the flour at 'Farinex' 3780 La Verendrye, Boisbriand, Quebec J7H 1R5, just outside Montreal. They are a supplier for bakeries but they also sell to individuals. A 20 kg bag costs around $30 canadian. Your loaves are always beautiful and your description of the fragrance they give off while baking makes me wish I could try those flours. Great job. I remember reading some posts about flour from Montreal...it has to be just sensational. You've got some wonderful flours. Your baking looks Gorgeous! I can just taste that baguette too! My aunt always tells me about the wonderful whole wheat breads her sister in law bakes when she goes to visit them in Canada. I thought that was funny about all the white powder coming over the border! Enjoyed all the information you collected, thank you, Don. I am very pleased with the Milanaise flours but you have to get used to them because they behave differently than the flours that we get in the US. I have several batches of bread to make this weekend because we are buried in a snow blizzard in DC. 24inches on the ground and probably another 6 to 9 inches to go. Great time for baking and no need to hit the grocery store for bread like most people! you are safe and sound. I saw news pictures those long lines of people waiting to stock up on bread and milk. What a good time to try out your new flours! Where can you find the ash content and the T55, T70/80 etc. information on their bag? I can only note from the nutrition facts label that the protein content is 5g instead of a 4g for other brands. I bought a 2Kg bag of the organic unbleached all purpose white flour when I first read your mention about this wonderful flour and made one loaf of bread with it and the result was a big failure. So I decided to wait for your comments before I play with it again. The amount of water suggested on the recipe on the bag seems to be less than 50%. Will you advise how much water did you use with this flour? I bought the large 20 kg bags that are sold to bakeries so the label on the bags has all the specifications listed. You can send an e-mail to www.info@lamilanaise.com and I am sure they will send the specs to you. Their customer service is very responsive. The T55 AP flour behaves differently than most US AP flours. It does not absorb as much water so I usually use 5% less water than if I am using KA AP flour. I have not seen the 2 kg bag but it seems like 50% hydration is rather low even for a less absorbent flour. For baguettes, I use 65 to 70% hydration with this flour. How vastly superior French type 80 flour is ... and you confirm this. You show us how a good high extraction flour (french style T80) can bring the levain and the bread to a totally new flavor dimension. Keep us posted with your experiments using French high extraction flour. Gorgeous loaves. Those would fetch a pretty penny at our local farmer's market. Beautiful breads and write up. Did you add any malt to the T55 baguettes? The color looks great. I was looking at the importer in the flour section but I couldn't identify the specific flour you used. Great post Don. Stay safe in the storm. I did not add any malted barley barley flour. I find that with the levain, I get good color. The flour importer does not have very detailed description of the flours but you can ask them for the All Purpose Unbleached White Flour (T55), the Sifted Bread Flour #100 (T80) and Sifted Bread Flour #50 (T110). They do not stock most of the flours but they will order for you from the mill. It is fresher that way. Your description of the flours, how they behave and so forth does make them sound much like what I've heard of French flours. Yet, I assume La Milanese uses Canadian flour, which I understand to be very high protein/gluten. So, is the mill really able to fiddle with their process to get a French T55-like flour from Canadian hard Spring wheat? Or are they importing French wheat to Canada? For their Organic Flours, La Milanaise uses hard red spring wheat grown in Quebec. They do not import any French wheat. They also have an affiliated company that produces not quite organic but natural flours using wheat from Saskatchewan. From what I understand through their milling and selective sifting process, they are able to produce a consistent product that is close to the French specs. When you use this flour for the first time, it can be frustrating because it behaves so differently than the US flours but once you get a hang of it, it is great. You mentioned that French flour needs less water, about 5% less you said. But you also said for baguette you do 65 - 70% hydration, which also works for non-French flour, doesn't it? So, is hydration required for French flour that different? From your experience, do you also find French flour need less or more kneading, stretch & folds, in general, because of slightly less protein/gluten? And because French flour (is said to) have more intrinsic flavour of its own, do you find it requres less over-night or long retarding, compared to other flour, to achieve the same level of favourness? I must qualify that La Milanaise flours are 100% Canadian milled according to French specifications from certified organic wheat grown in Quebec province. I have never worked with true French flours so I have no basis for comparison except for published description of their properties and behavior. 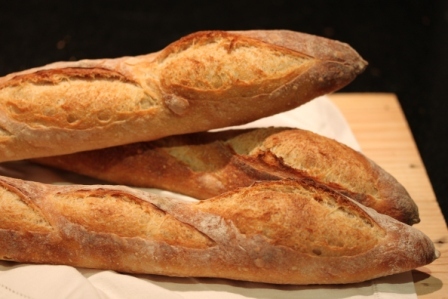 Earlier in my baking life when I was using strictly US flour, I tended to use lower hydration for baguettes around 65-70% hydration depending on the recipe for ease of shaping and scoring but I have come to prefer a higher hydration around 70-75%. That is why I reduce the hydration by 5% to 65-70% when using the T55. I find that with the T55, the dough tends to come together faster with less handling. By the second set of stretch and fold, the dough is noticeably less sticky and hardly adheres to the side of the bowl. For baguettes using strictly all white flour, I did not detect much difference in flavor between the US AP and the T55. I just prefer the texture of the crumb of the T55. I have made the same recipe of my Pain de Campagne au Levain using a US AP and WW flour mix and a T55,T80 and T110 flour mix. Hands down the high extraction flour mix is superior in terms of fragrance, texture and flavor. Your explanation answered a lot of questions as to how can Hard Red Spring Wheat which apparently has a high gluten content be used for French style flours which has lower gluten content. Vous avez de superbes produits. Merci.